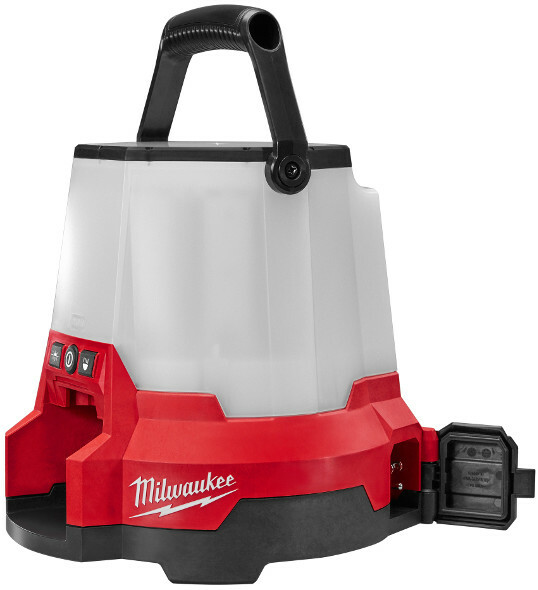 We previously posted about some of the new Milwaukee LED products for this year. 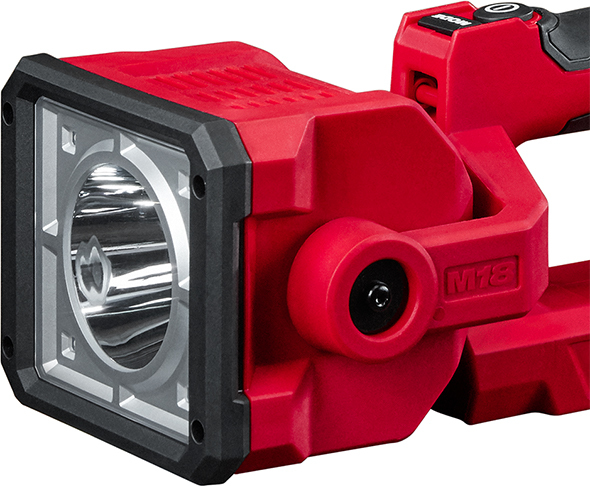 Most notably, there’s the new M18 Radius wide-area worklight, the “Rover,” a clamping M12 flood light (mentioned about halfway into our 2016 media event preview), and a new M12 flashlight. There’s also a battery-charging version of their tripod light stand, called the “Rocket,” which we’ll post about later on. 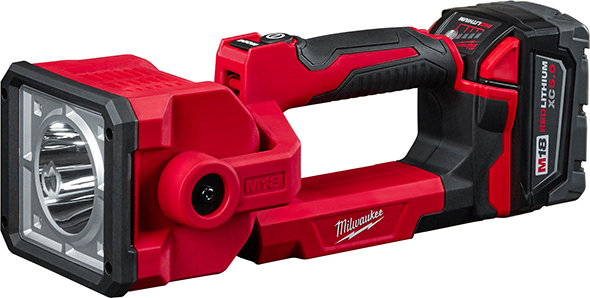 Also new from Milwaukee is this M18 4-mode LED search light, model 2354. 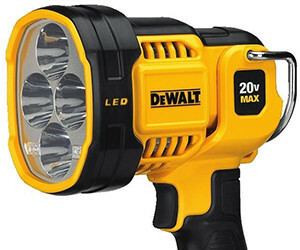 This new cordless search light is designed to be far-reaching and bright. It can light up a target area more than 700 yards away, with up to 1250 lumens of light. The new search light has a pivoting head with a 198° range of motion. It’s weather resistant, with an IP54 rating, and also has a high-impact and durable polycarbonate lens. Runtime specs are based on a 5.0Ah battery pack. There will be a kit option, 2354-21, which comes with a M18 XC 5.0Ah battery pack and charger, and a bare tool option, 2354-20. I have to say no other tool company comes close to offing the same kind of lighting options like Milwaukee. I just wish the prices were a tad cheaper though, but I will say the lights I have have worked really good and are high quality. I must agree with everything you said. The prices seem to have crept up each year for new lighting products. I’m particularly interested in the rocket led tower light but $399 is a bit ridiculous all things considered. I’m a huge Milwaukee fan, but four hundo is an insane amount for a light. As it is, I really like all of the lighting innovations that big red has put out, but a lot of them are unreasonably expensive. 80 dollars for the M12 stick light, and 100 for the M12 aluminum light strikes me as exorbitant. Agreed, I was expecting $129-179. Interesting thing on Milwaukees website is that the bare tool is not specified to include the shoulder strap. Pretty cool! I may buy into M18 if the hydraulic driver is as good as I’m hoping. I wonder what’s up with the “patent pending” on spot-flood mode. By the looks up it, I’m thinking it would just be using the LED in the big reflector (spot) in conjunction with the four other LEDs (flood). The old LED stand never had the name “Rocket” until recently, but now you see it everywhere. So is the new one going to the the Rocket2…. This light doesnt have a 4 way pivot right? Just 198 degrees on 1 axis? 4 way would be awesome. Looks to be up/down onlyour, but considering the grip, right/left pivoting can be done manually. If you’ve already have Milwaukee batteries and charger, this sounds like a good deal, considering what you get, but the full kit is a bit steep. Still, I may have to add this to my x-mas list. Changing gears, an IP54 would give this a Splash Proof rating. It would need an IP67 or 68 to be considered water proof. Good point, thanks! I changed the description to say weather resistant. Minor typo at end, -20 is tool-only. $99 is cheap. Milwaukee’s light pricing makes no sense. I’ve never understood why the stick lights are more expensive than the lanterns. There’s way more LED’s in the lanterns, and they actually have internal moving parts. 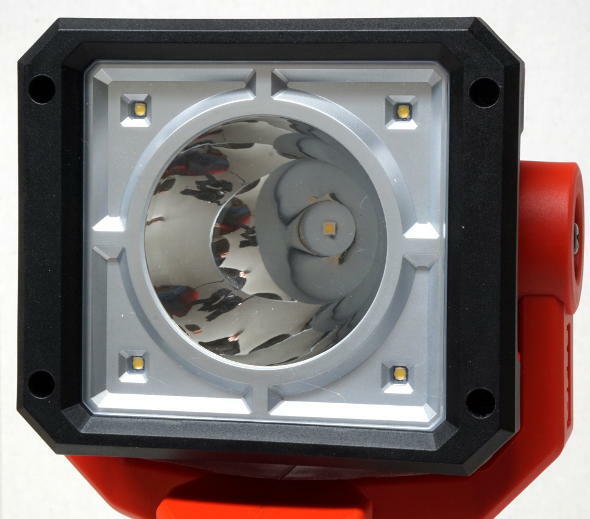 Especially since I found the M12 clamp flood light preorder is priced at $134, not sure if thats the real street price. How could the M18 search be cheaper!?!? I see the M12 Rover as having a $79 bare toold price tag. I asked for a double check, just to be sure. Not in the Milwaukee echo system so would need the kit. 3 bills for kicked up flashlight is a little too rich for me. Already have tons of different lights just like everyone else including 2 from Makita but did add a new one recently that has been very handy. Milwaukee has done a phenomenal job with their lighting products. They rival those from many companies that are dedicated to their design. I would say that since advancements are coming so quickly with LEDs that the only downside may be how relatively quickly they seem outdated in terms of performance, but they are excellent in terms of sturdiness, brightness, color accuracy, and runtime. Has anyone seen the new light that clips onto a bucket truck bucket? It has two of these heads on it. I just saw it listed with a price – a whopping $750! Well, I just got my hands on this light and I have to say it is very impressive. The advertising materials do not show just how small the spot light is though. The spot is very focused. All in all I want one! While the light is certainly cool, I wouldn’t go so far as to say they are thinking outside the box here. Pelican has had a very similar light to this for a while in the 9410, and the DeWalt DCL043 is similar as well – at a lower price point. It was a judgement call, based on the design and what I’ve seen other power tool brands comes out with.